Incheon  (Korean: 인천, Chinese characters: 仁川), also Inchon, is a city in South Korea on the coast directly to the west of Seoul. Incheon is an historically and economically significant place for Koreans. During the Korean War, the city was the site of the Incheon Landing by American forces. Today, Incheon is a metropolitan city with the population of about 2.8 million, politically independent from Seoul. Also, the city serves as a transportation hub by air and sea, with a massive harbor and the world best international airport. Several beautiful islands, such as Yeongjong Island and Ganghwa Island, are also within city limits. The status of the area is set to increase as various national projects are in development in Incheon. The New Songdo City plan, the most expensive real estate development in Korean history, will be finished in 2015. One of the world's tallest twin tower buildings, 151 Incheon tower, is under early construction and Korea's current tallest building, the Northeast Asia Trade Tower, is already finished. Incheon is planning to launch further independent mini-cities for shopping, housing, and education. Added to this real estate development, Incheon will also invite a large number of visitors for the 2014 Incheon Asian Games. Despite these developments, the Songdo area of Incheon is currently unfinished and largely uninhabited, not yet a viable destination for tourists. Travelers are more likely to enjoy the bustling eastern side of Incheon which blurs into the vast expanse of Seoul. Incheon International Airport, South Korea's main gateway, is on Yeongjong Island. The AREX  train connects the airport to Gyeyang (20 min, $ 2.50), where you can transfer to the Incheon subway line. Alternatively, the limousine bus line (50 min, $ 10) is always available to go to many places in Incheon, or you can take a taxi (25 min, $ 50) to get into the city. Incheon Port International Ferry Terminal 1 and Terminal 2 (Yeonan Budu)  has connections to several cities in China, such as Weihai, Dandong, Qingdao and Tianjin. The largest operator is now Weidong , but passengers can look at full listings on a website . These ferries are similar to miniature cruise lines and provide karaoke rooms, console games, and DVD rentals (private rooms only). The trip can take as long as 24-hours, so if you have an economy ticket, request a sleeper bunk for a comfortable trip. If they are all taken, however, the only other option for an economy ticket is the sleeping deck where everyone will stay like sardines in a can. Arrive at the terminal 2-3 hours before departure to ensure there is availability for the bunks. Kyeong-in line called Metropolitan Line 1 (for less than $ 3) links Seoul to Incheon. Also, the line often provides express trains that skip some minor stops between Dong-incheon station and Yongsan station. By using the express trains (for the same fare), passengers can save up to 30 minutes depending on where they go. As of summer 2012, a new commuter rail line started operation. The name of this line is Suin line. Currently, the line starts from Oido station in Siheung and terminates Songdo station in Incheon. From various cities in South Korea there are numerous Intercity Bus routes heading to Incheon. Travellers can book some routes from website  such as Busan, Daegu and Gwangju. From Seoul, there are some express bus routes which mainly exist for commuters. Most of them connect Incheon from Seoul station, Shinchon and Gangnam station. For example, route 1400 links Seoul station, shinchon, Hongdae and Bupyeong. There are several ways to get around in Incheon. Subway: the subway is one of the fastest and easiest ways to get around Incheon. There are five subway lines that run through Incheon, taking visitors to all the major districts in the city. The Airport Railroad begins at Incheon International Airport and runs across northern Incheon and on to Seoul. The Incheon Line runs north to south from Gyeyang Station to Songdo New City. Seoul Line 1 and Seoul Line 7 bring passengers in from Seoul, connecting to the Incheon Line at Bupyeong Station and Bupyeong-gu Office Station. The recently built Suin Line takes passengers across the southern Incheon. This line will be expanded further to connect Incheon to Suwon. Fares start at 900 won and increase with distance. Transportation cards can be purchased in English at the automated machines found in the subway station. Visitors can also buy transportation cards at most convenience stores. Bus: if the subway doesn't go where you need to go, the bus is a great option. Buses run through almost every neighborhood in Incheon. Green buses, known as neighborhood buses, take passengers around the local neighborhood or district. Blue buses, known as the city buses, take passengers from district to district across the city. Green/White buses and Red buses take passengers from Incheon to Bucheon and Seoul. Fares are different for each type of bus, ranging from 800 won to 2,500 won. You can pay with exact change or use a transportation card purchased at the convenience store. Taxi: taxis will take visitors anywhere in the city. Fares start from 2,600 won and increase with distance. However, taxi drivers usually don't speak English, so know where you are going and have the address written down to make it easier for you. Arts Centre central square (Rodeo street), Guwol-Dong. 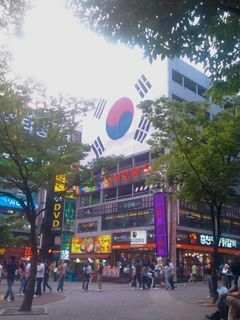 Bupyeong is one of the liveliest places to visit in Incheon. There are many restaurants, shops, and bars in the area, so it is an excellent place to spend an afternoon or evening The area also boasts the largest underground shopping malls in Korea, containing hundreds of small shops selling everything from make-up and clothing to electronics. But beware, visitors may get lost because of the crowded and relatively confusing corridors. The shops and restaurants in Bupyeong are mainly located directly across from the large Bupyeong station building while the underground shopping mall begins as soon as you exit the station. Arts Centre is an arts and entertainment venue located in Guwol-dong (with which it is loosely synonymous). There are several large department stores, cinemas, designer shops, restaurants, and a central square named Rodeo Street. Sporting events are sometimes shown on a screen in the central square. Also, the place has a couple of stadiums for professional baseball and soccer games. Liberty Park Liberty Park is located next to Chinatown. For most Incheon citizens, the park is well known for General MacArthur's statue and the memorial of the Centennial Anniversary of U.S. and South Korea relation. Independence Memorial Hall This was built to celebrate the Korea's independence from Japan. There are a monument of General MacArthur and several other statues that symbolize the country's independence. Songdo International City It is a multi-billion dollar planned city where Korea's tallest building, the North Asia Trade Tower, is located. In addtion, the world's tallest twin tower buildings, 151 Incheon Tower, are in the early stage of construction. As part of the Free Economic Zone, Songdo represents the bright future of Incheon. This area is still very much in development, however, and not currently recommended for visitors. Incheon Islands There are several islands accessible by ferries. Most islands provide comfortable environment with fresh air and various cuisines that allow visitors to stay away from city life for a while. Also, islands have great hiking roads and beaches. Here are several islands people can easily visit: Daecheongdo, Yeonpyeongdo, Ganghwado, Yeongjongdo, Muuido, and Deokjeokdo. Wolmido. It was a major harbor in Incheon until Yeonan Budu appeared. However, visitors can still do many things in Wolmido. There is a small park, surrounded by a nature walk road. There are also many seafood restaurants and cafes with a great ocean view. What is more, a small harbor that can bring visitors to several islands is still operating. Jeondeungsa Temple. is a is the oldest temple in Korea, and is a good place to see Korea's ancient past. It's located in Ganghwa Island, just north of Incheon airport and near to North Korea. The island is close to the mainland and is easily accessible by car over one of two bridges (no toll). Interested visitors can reserve an appropriately modest room through the Templestay program. The Jet Lagged Lizard Western Sports bar Irish Pub. Its a place near Incheon Airport where a lot of Flight Crew Hangout. Good food and drinks. Goose Goose, Bupyeong. Innocuous enough from the outside, Goose Goose is an old favorite in the neighborhood and regularly has a good crowd on any given Saturday night. The "pub jukebox" is an open desktop computer running iTunes. Woodstock, Bupyeong. Small bar but it has a good atmosphere and some outdoor seating. Good place to meet locals as well as foreigners. Chunnyue Sarang(천년의 사랑), Songdo hiltop hotel street. Korea's original tea & wine, snack. The master's dress is oriental korea costum and interier is Oriental Calture style. Rio's Western Bar, Guwol-Dong Square (Arts Center). Perhaps the only 'Western-style' bar outside of Bupyeong regularly packed with foreigners. The pub is quite well hidden and therefore tends to attract the same local English teachers rather than wandering tourists. Located on the 3rd floor in the same building is the massive (and rather infamous) King Kong Hof, also frequented by Westerners on weekends"
Chinatown has been a very popular place, for especially Chinese food. In fact, many Chinese restaurants in Chinatown owned by Chinese; therefore, both languages, Korean and Chinese, will available to make an order for original Chinese cuisine. There is also a foreign-owned western-style restaurant on the edge of Chinatown called Fog City They speak English and have pizza, pasta and steaks. Their sourdough bread is made in house and is unlike anything else in Korea. Yeonsugu A small district near the beginning of Incheon Line 1. Home to Songdo International City and a lot of teachers, engineers and GCF workers. Liquor Burger This is Yeonsu dong's western bar and the go-to for beer, burgers and events. The bar is owned by a very friendly American guy and his Korean wife. They have dart leagues, foosball, live music, movie nights and on-demand music videos for free. It's a small neighborhood, so everyone knows everyone. You'll never go there without seeing a friendly face. Address: Incheon, Yeonsugu, Yeonsu2dong, 600-1, Third Floor. www.liquorburger.com. 032-816-8988. SongDo International City also has many great restaurants. The place is specialized in serving Korean and Japanese restaurants. Famous restaurants are Kyungbokung, Nagoya, Sapporo, etc. Also, if someone gets around the place, one can meet a variety of bars to drink. There are a variety of hotels in the city. This page was last edited on 22 February 2019, at 16:18.